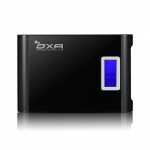 OXA USA COM via Amazon.com has OXA Juice Box S2 10000mAh Dual USB External Battery Pack w/ LED Flashlight (Black) on sale for $15.99. Shipping is free with Prime or if you spend $35 or more. The 10000mAh Juice Box S2 Power Bank is designed to deliver long lasting, high capacity power to all of your mobile devices.The advanced technology and battery power packed into this powerful, durable, stylish, portable and light weight product will amaze and delight. The device has a round button on the side to power on and off, and digital screen to display how much power is left. A really nifty feature is a flashlight that you can use in case of emergency or if there’s a black out. Advanced power lock technology and ensure battery safety. The device will automatic shutdown when short circuit or over charging happened to avoid destroy the device and accident. Dual USB output ports, perfect for rapidly charging the external battery. The USB cable with 3 mobile phone/tablet connectors is compatible with many cell phones.